This will be a short post, because it’s Christmas and I’m sure you want to spend the day sharing love. However, I think at this time, since there will be a lot of gift giving, hopefully to you as well, I wanted to talk about the art of receiving gifts like a lady. Specifically a very important giving scenario where many women fall short. Should I accept gifts that appear to be offered out of charity? 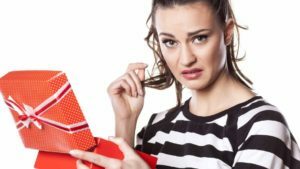 When you’re dating a social class above yours (which we discuss frequently on this blog), it is not uncommon for people in his circles to offer you gifts. However, it is important to be discerning about which gifts you accept. Rich people have lots to give and exchange. Be wary if they start offering you left over food, old clothes and dirty or used items. It’s tempting to accept the offer thinking that it will somehow ingratiate you with them. It won’t! Accepting such items is a no no! Politely decline such offers because it will associate you in their minds with garbage. Ergo, if you accept left overs, you’ll be treated like the garbage disposal. Share what you received for Christmas or your favorite holiday gift in the comment section below, and have a happy holiday! Subscribe to our mailing list to receive the free e-book "HOW TO MAKE MEN SPEND MONEY ON YOU"